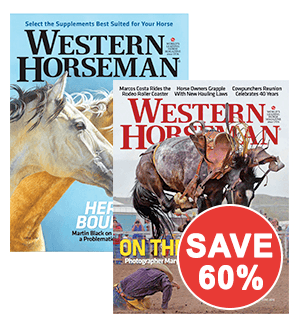 Subscribe to Western Horseman Your Way – Print, Digital or ALL-ACCESS (Print + Digital)! For more than 70 years, Western Horseman has been publishing complete, accurate tips on better ways to care for your horse, the best equipment, stable management, places to ride and much more! All brought to you by our experienced staff of horse owners and professionals. Start your subscription now! SUBSCRIBERS' AUTOMATIC RENEWAL FEATURE: I understand that I will receive uninterrupted service and delivery of my magazine and that my subscription will be automatically renewed each year at the rate then in effect. I won't be bothered with any renewal notices in the mail; instead, I will receive a clearly marked annual reminder about 60 days before my credit card is charged or a bill is sent. I may cancel at any time during my subscription and receive a refund on any unmailed issues by calling 1-800-877-5278 or visiting Subscriber Services. If giving a gift, this does not apply to your subscription or your gift subscription. If you are ever dissatisfied with your subscription for any reason, you may cancel and receive a full refund for all unmailed issues. Copyright © Western Horseman. All Rights Reserved. Reproduction in whole or in part without permission is prohibited.